A super cute Newfoundland Dog named Ella was patient with us while we photographed her near the Eagle River in Southern Labrador, Canada. 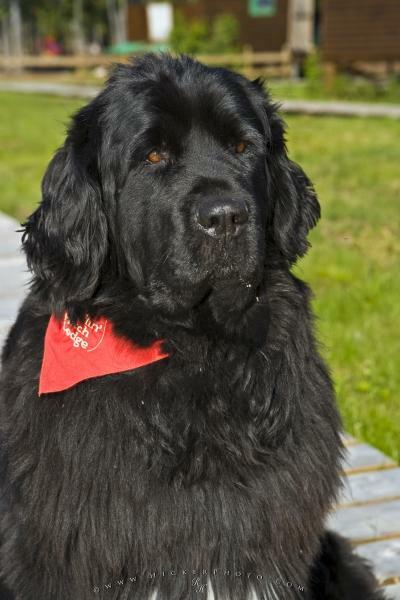 Ella the Newfoundland Dog, Canis familiaris, at Rifflin'Hitch Lodge on the banks of the Eagle River in Southern Labrador, Labrador, Newfoundland and Labrador, Canada. Rifflin'Hitch Lodge in Labrador, Canada. Pictures from photo gallery "Animal Pictures"
This picture is part of the photo album "Animal Pictures" - there are more beautiful images waiting for you.